Last week we told you about a New York City artist who, in an effort to prove a point to her friend about fast food being a culinary abomination, bought a McDonald's Happy Meal and left it out in her kitchen for six months (see pictures at the original post). In that span of time, the food showed little, if any, decomposition. The post was sort of shocking and wildly popular, registering millions of page views and thousands of comments, and was shared on Facebook by more than 311,000 readers. But that's not the only way readers reacted: A huge number of you, including numerous medical professionals, flooded our inboxes with your own stories of Happy Meals that refuse to die. Many told us that they too have been keeping food from McDonald's for years, either as a tool to demonstrate to others just how unhealthy fast food is, or just to educate themselves about what they put into their bodies. And some of these people (McDonald's hoarders?) shared pictures of their food with us. So we're going to share them with you. 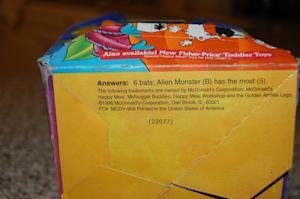 I wanted to let your team know that I have a Happy Meal in my chiropractic wellness center that was purchased in 2006. I have been using it in patient education lectures and displaying it in my office for educational purposes. It also has not decomposed at all and has no mold on … just a little dust from being around so long! 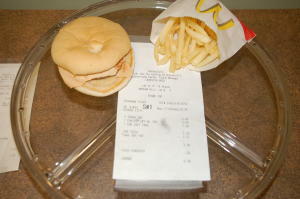 I use it as an example to show my athletes what they eat when they buy fast food. ... The dots on the cheese are the onions. The pic below of a McNugget and fries was sent in by George Skoulikaris of Chicago, who told us that his neighbor has kept the food in a cabinet in his kitchen since December. Just wanted to let you know that the burger story is absolutely true! 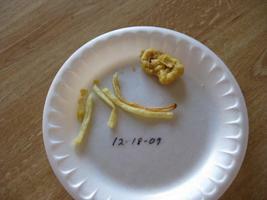 I am a physician and I bought a Big Mac over 10 years ago and it has STILL not decayed one bit. Even the bread has never molded! I use it as a teaching tool to show my patients the dangers of fast food with all their chemicals. People ask us all the time if we have done anything to it to make it do that. They think we must have sprayed it with something. But honestly, we haven't done anything but let it collect dust. 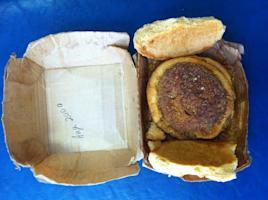 The initial smell of the burger and fries went away within a day or two and now it has a slight cardboard scent to it. We have a 'Do Not Touch' sign on it to keep the janitor from throwing it away, but we encourage our patients to pick it up, look at it, smell it, etc. Nothing seems to phase it though. We explain to people that live food should rot, mold, or otherwise decompose. There is no life left in that food. It may not be the ingredients, but the way it was prepared. The paper is actually deteriorating faster than the food. It's been sitting in a dark closet all this time, no bugs, no mold, no nothings. Every now and then she pulls it out and we look in wonder at how nothing has changed, still looks like a happy meal. Now, it should be noted that none of this is scientific, and there are certainly some who question the validity of these sorts of at-home experiments with fast food. McDonald's also blasted such claims of years-old, non-decomposed food as "completely unsubstantiated ... in the realm of urban legends" in a statement the company sent to The Upshot last week. "McDonald's hamburger patties in the United States are made with 100% USDA-inspected ground beef," the company said through a spokesperson. 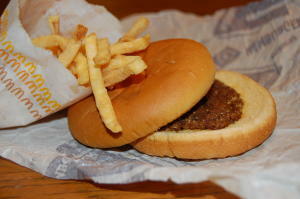 "Our hamburgers are cooked and prepared with salt, pepper and nothing else -- no preservatives, no fillers. Our hamburger buns are baked locally, are made from North American-grown wheat flour and include common government-approved ingredients designed to assure food quality and safety. ... 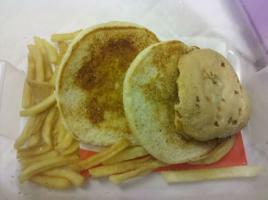 According to Dr. Michael Doyle, Director, Center for Food Safety at the University of Georgia, 'From a scientific perspective, I can safely say that the way McDonald's hamburgers are freshly processed, no hamburger would look like this after one year unless it was tampered with or held frozen." We'll leave it up to you to make up your own mind about all this. And if, by chance, you care to watch a live stream of a McDonald's burger decomposing, or not, you can do so here. 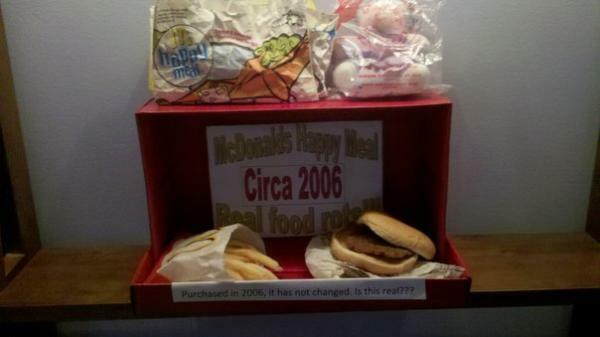 But we find it pretty funny that so many people out there have aging fast food on display in their homes and offices.